Last year, Overwatch got a capture-the-flag mode. It was a fun distraction from the usual payload-pushing antics, but the game wasn’t designed with CTF in mind, and it showed. Some heroes were overpowered, levels were stale, and stalemates abounded. As part of this week’s “Year of the Dog” event, Blizzard has revamped the mode, and it’s way better. The CTF changes, which include new rules and a new map made specifically for the mode, were intended to make things more balanced and action-packed. After playing for a few hours last night, I’m inclined to say that it’s succeeded, for the most part. 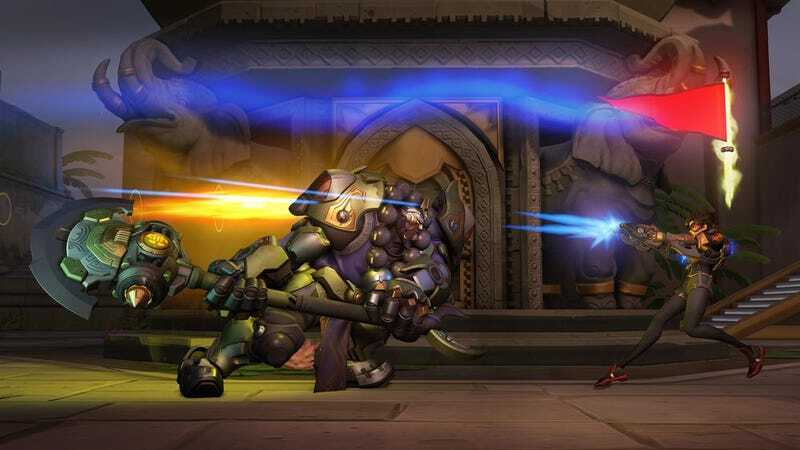 Overwatch’s take on CTF is still a bit too prone to stalemates, but now the action keeps moving even when nobody’s trying to scurry away with a flag. Let’s start with the new rules, most of which center around how the flag works. 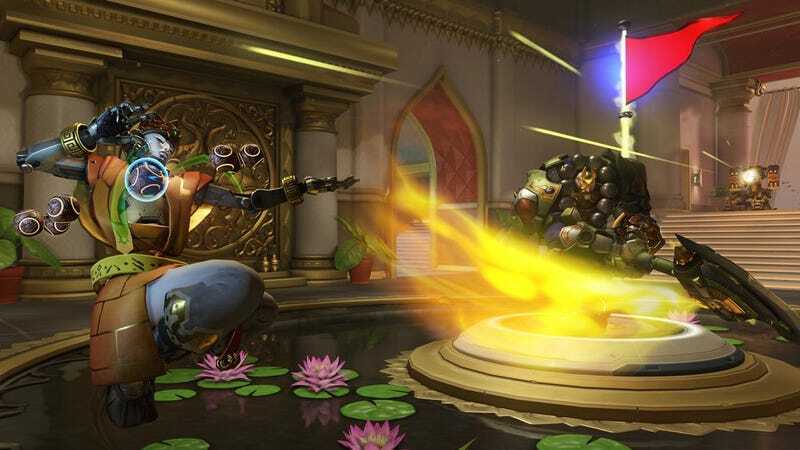 While it’s kinda unintuitive at first, using mobility skills—D.Va’s boosters, Tracer’s time jumps, or Winston’s leaps, for example—cause you to immediately drop the flag, meaning that high-mobility characters no longer make or break your team’s chances at victory. In addition, flag pick-up is instant, but it takes five seconds for anyone to be able to snag a flag again after it’s been dropped, and it takes an additional four seconds of standing on it to return it to base if it belongs to your team. This means that instead of flag grabs that instantly succeed or fail, you get more moments where someone might get a flag out of the enemy team’s base only to die on the doorstep, at which point both teams skirmish for a chance at grabbing the flag. The result is a series of violence-ridden chase scenes, like something out of a Looney Tunes cartoon. The rhythm of it all is nail-biting. The new level, Ayutthaya, works in concert with that combat rhythm to allow for a variety of strategies. At a glance, Ayutthaya’s structure is fairly simple. You’ve got two bases separated by an open courtyard. That’s it. The bases, however, turn out to be multilayered mazes of underground passages, walkways, and balconies, while the courtyard is full of raised surfaces and bits of cover. As a result, I’ve had great success with a number of heroes, from a hyper-aggressive D.Va to a wily Winston to a sneaky Moira. The level succeeds because, perhaps more so than any other Overwatch level, it contains no wasted space. In terms of square footage, it’s small, which means players on both teams are constantly forced into contact with each other, even when they aren’t necessarily making a push toward the flag. Fights generally occur at close quarters, which prioritizes characters who excel in tight spaces. 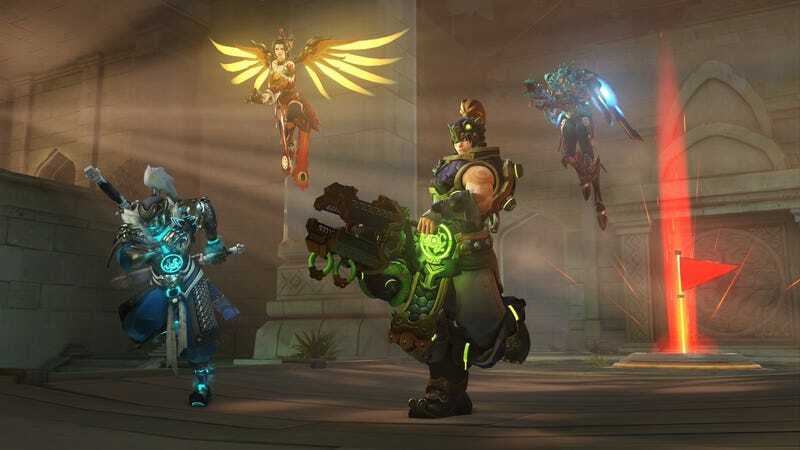 But the level’s so multi-faceted that it also allows for, say, a Pharah to hold down the courtyard by soaring around and lobbing rockets, or a Junkrat to creep around the tunnels of the enemy base and pester with grenades and RIP tires, ensuring that enemies are bleary eyed and irritated by the time your team makes a big push. I’ve still found that matches tend toward a sort of equilibrium where neither team can hold onto the enemy flag for long, but typically one team gets at least one capture before matches are over. And when they don’t, sudden death ensures that things end on a high note, moving both flags outside their respective bases and, therefore, closer together. Sudden death is chaos, albeit of a somewhat predictable sort. First team to nail the other with a big ult wins, basically. Reason being, the sudden death flag space is narrow and confined—an easy spot for a Pharah barrage, a D.Va bomb, or a Zarya combo with basically anything, in other words. With teams so close together, though, every skirmish up to that point is as intense as the finish. On the whole, CTF still isn’t balanced perfectly, and matches can get sloggy here and there, but this year’s offering is much better than what’s come before. I haven’t always been sold on the idea of CTF in Overwatch, but I’m glad Blizzard stuck with it.